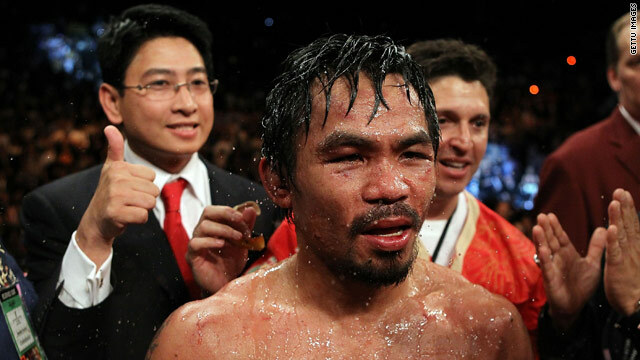 Manny Pacquiao could still fight Floyd Mayweather despite talks breaking down over their March contest. (CNN) -- Boxing promoter Oscar De La Hoya has revealed that despite their feud outside the ring -- he has not given up trying to convince Manny Pacquiao to fight his client Floyd Mayweather. "That fight has to happen," said De La Hoya at a news conference to promote another fight. "It's too big not to happen. We just have to cross one hurdle at a time," added the American of the proposed world welterweight bout which fell through earlier this month in a drug-testing dispute. Mayweather and Pacquiao almost cut a deal this month, but claimed they could not agree on a 10-day gap in the timing of drug tests prior to their proposed March 13 bout. "The public will hopefully make him change his mind," De La Hoya added. "Why would you not want to earn $40 million dollars? Why would you not want to show the public that all this speculation is nonsense? Be the one to stand up and say it." Filipino Pacquiao, boxing's pound-for-pound king, is currently scheduled to square off against Joshua Clottey at the Dallas Cowboys Stadium in Texas on March 13. Meanwhile, De La Hoya also said that Mayweather and Shane Mosley are in talks to possibly meet on May 1 in Las Vegas. Meanwhile, WBA heavyweight champion David Haye has confirmed he will make the first defence of his belt against American John Ruiz in Manchester in April. The Briton claimed the title when he defeated Russian giant Nikolay Valuev in Nuremberg in November and now former WBA champion Ruiz at the MEN Arena on April 3. "It's been 10 years since the heavyweight championship has been fought in Britain and everyone knows I had to go to Germany to take the title away from Nikolay Valuev," Haye told a press conference. "Now it's time to showcase my skills again in front of the great British public," added the 29-year-old.